Water is the theme in this category, from flooded roads to shipwrecks. 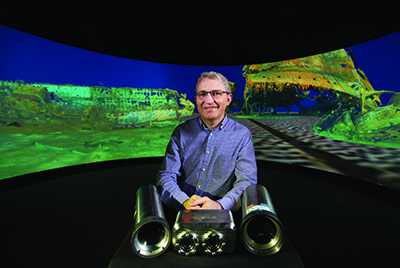 In 2015, a team from Curtin University, WA Museum and DOF Subsea conducted a detailed 3D imaging survey of the wrecks of HMAS Sydney II and HSK Kormoran – located in 2500 m of water, 200 km west of Shark Bay. The ships sunk each other during a battle in 1941 with the wrecks only discovered in 2008. A custom deep-water lighting and camera package was developed for the project, which acquired 500,000 images and 300 hours of high-definition footage – much of that in 3D. The system allowed real-time download of much of the image and video data allowing real time quality control of the data. The dataset is being processed to produce a range of cultural heritage outputs – early outputs include a small exhibition and short 3D fi lm at Museum of Geraldton and a book From Great Depths. Andrew Woods was the technology lead on the project. With input from colleagues he designed the overall system, worked closely with suppliers to deliver the required components, integrated the completed system, managed a team of three working on the technical systems, and modified some electronics systems to meet performance. The engineering breakthrough was the development of a unique system to conduct detailed 3D surveys of underwater infrastructure, including: customisation of hardware and soft ware allowing real-time download of images from digital cameras, integrating a range of equipment to meet overall project needs, development of 3D digital still cameras to collect unique underwater 3D views, development of surface control room hardware and soft ware to operate the full system, and design of a data collection system to meet specific 3D imaging capture requirements. “[The team] has pulled off something fantastic, singular in the history of Australian maritime archaeology,” said Andy Viduka, Assistant Director Maritime Heritage, Department of Environment. The major cause of death during floods comes from people voluntarily entering flood waters either on foot or in a vehicle. 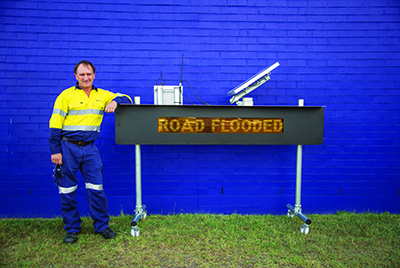 Greg Kelly, an engineer from Logan City Council in south Brisbane, has developed a Flooded Roads Smart Warning System which provides on-site and off -site notification about the status of a flooded road and disseminates the information to a database, and sends SMS and emails to relevant parties. The system provides a much-needed, affordable, safety aspect to flood-prone roads in the council area, which alerts emergency services and on-call council officers as well as local road users. On a flooding incident, a sensor at the lowest point in road level communicates to a ‘Road subject to flooding’ sign, mounted with a solar powered, high-luminescence lightboard that displays text ‘ROAD FLOODED’ to alert oncoming drivers. The sign also relays the flooding incident via a 3G communications module to a council-dedicated mobile phone (for on-call officers) and emails relevant parties. The information gathered populates a spreadsheet and is planned to further disseminate to Logan city council’s disaster dashboard, Queensland Main Road’s Flood map and eventually link with popular consumer mapping platforms like Google Maps. Version 3 of the system employs wireless (433 MHz RF) for the connection of the sensor to the actuator, which removes the need for expensive trenching costs for cabling. The system is an autonomous unit that has two signs per site, with built-in self-diagnostics and runs on solar power and existing telecommunications infrastructure. There are two configurations: one for the display of customisable text and another for alternating pair of traffi c lights. Another aspect of Kelly’s contribution was mentoring engineering students from various universities who helped work on the project. Green-Blue Walls are low-energy, low-cost water treatment technologies that are also urban green infrastructure systems that can reduce local temperatures, and increase biodiversity and amenity value of urban areas. They are designed to harness natural processes to reduce total phosphorus concentrations from light greywater and stormwater. This puts them a step ahead of rain gardens and vegetated walls installed for ornamental reasons only. While at Monash University, Professor Ana Deletic was instrumental in the development of Green-Blue Walls and other biofilters. Over 10,000 biofilters (or rain gardens) designed according to her team’s specifications have been installed in Melbourne. The Green-Blue Walls are vegetated water filters. As inflow water percolates via gravity through the engineered media and plant roots, total phosphorous (TP) is retained within the system, and the treated water gets either discharged into receiving water bodies or re-used for irrigation of urban gardens or toilet flushing. In all cases, the system acts to protect aquatic ecosystems. Their treatment of light greywater and urban stormwater can be performed in a hybrid mode (the same system treats stormwater when it rains and greywater when it is generated) or in a single mode (either stormwater or greywater). The systems are flexible and scalable; they can be installed as small planter boxes or take up entire walls of multi-story buildings. For greywater treatment only, around 1.8 m2 of the fi lter surface area is required for treatment of 100 L of greywater per day.